So I would like to discuss about one of the least talked, yet very important details of Classified: Broken Arrow's recreation of the MPD. Besides this picture, a cipher is our only source of information concerning this topic. We’ve requested they immediately begin investigating weaponized solutions to "combat" the Samantha threat. Groom Lake is delivering a shipment of element 115 to the site in Washington so they may begin testing. The Hanford project has requested access to all research regarding the MPD reconstruction project, however I declined this request. At this time this project should remain at Groom lake – in recent months they have proven more than capable. It may be our greatest asset in the fight against this threat. Written in 1963, McNamara states that the MPD copy is being constructed in Groom Lake, and not at the Hanford Site. In the 1960s, the US and USSR were involved in the global Cold War, a battle between communism and capitalism. As both powers were desperately trying to be the first to fly to the Moon, secretly in order to scavenge the precious left-overs of Group 935 in Griffin Station and becone the world's sole superpower, the American organization known as Broken Arrow was focussing on an alternative way for reaching Luna: Matter Transference. The astronauts of the first Moon landing, accomplished by the US, might actually have used an M.T.D. , built by Broken Arrow at Groom Lake. I previously theorized that the Avogadro might be the product of MPD testing, and Hanford's 'Power Plant' being the MPD, as the Timeline notably uses the word ''accidently''. This contradicts the cipher, where is stated that the MPD was being reconstructed at Area 51, and not in Hanford. The Avogadro (and Denizens), however, are created years later, in 2025, so the possibility that Broken Arrow transfered the MPD to the Hanford Works is still open. Anyway, at the time Classified takes place, the MPD still is located in Nevada, as are Ultimis. Coincidence? Why is Doctor Richthofen still so calm in that cage, as everything goes to plan? What could happen next? What would happen anyway, if two souls both would enter an MPD? 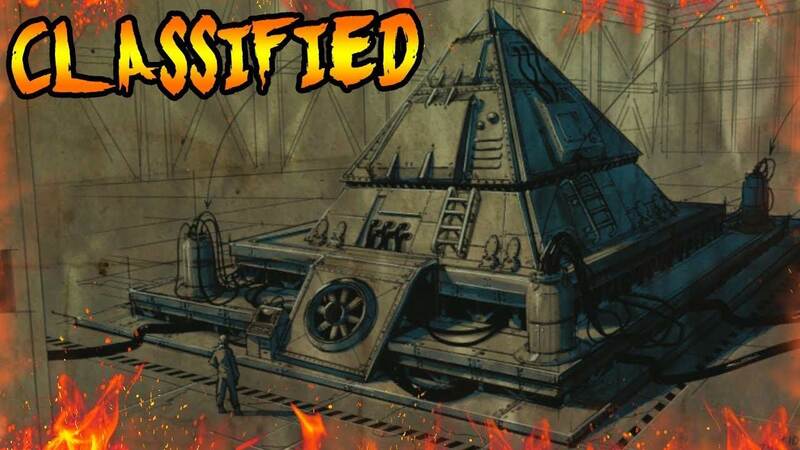 If we will ever get to know, this will give us alot more info about the understanding and capabilities of the Aether Pyramid Device. Not related to Classified, but a detail I was never sure of is the stone pyramid in Der Eisendrache. On the surface it just seems like a normal, small pyramid, but consider what it can do. It can simulate the Moon’s gravity over a large area, and it forms a connection with the MPD, enough so that Primis is able to teleport the Moon’s MPD directly to it. It seems to have been deliberately made to mimic the original and has a connection to it. The question is: who built it? If it was Richtofen’s group from Group 935, why is it made of stone, and why bother when they can instantly teleport to the MPD’s location? If it was the Wolf King’s men, how did they know about the MPD on the Moon, or was it by complete accident? Also if that’s the case, what a coincidence that Eagle’s Nest, the direct correspondant to the Moon, is created there. Maybe that is part of the cycle that Primis intended to continue when they instructed the Wolf King to build the castle. The Stone Pyramid remains one of the larger riddles of BO3 to me. Just like MotD and BotD, Der Eisendrache is one of those few maps I do not have and never really got into its story, and I've always hoped others would understand it better than me (not that I would understand it otherwise, though). The location and material resembles more of that of an ancient or medieval structure, rather than Richthofen's/935 tech. The question, indeed, is what is actually is, and why it is built. Around the time before DE's release, I remember people mentioning Werfen (the location of Der Eisendrache) also being the location of the 'Eisriesenwelt', which, in my best German, translates to something like Ice Giant World. It is a large ice cavern network believed to be a gateway to Hell. Now the MPD is also a gateway to Hell, so I could see some connection there (but maybe I'm just rambling). I think either the Wolfking's knights, or perhaps the Keepers or Apothicans built it. Could you explain the presence of the corrupted Keeper in that thing, and what actually happebs during the Easter Egg? Back to the original topic: I wonder who was the first testsubject they put into the MPD reconstruction, if it ever was finished. One audio fragment I've always found interesting. Schuster: Log entry 97. August 3rd, 1963. The Matter Transference Devicehas been realigned... again in order to accommodate additional temporal variables. This is test number 11. Human subject 5: Private Hastings. If the transference facts are correct, Private Hastings will arrive at Griffin Station on August 3rd, 1963. If he arrives at this date, a communication link will be successfully established and we would have confirmed that the teleporters temporal anomalies have been compensated for. Schuster: Are you ready, Private Hastings? Schuster: I can't understand a word of what he's saying with that ridiculous space suit. A simple thumbs-up will suffice Private Hastings. Good! Initiate the transference matrix. Schuster: Doctor Richards, did it work? Do we have a stable connection? Richards: No sir, nothing. We've lost him. Schuster: That's the fifth man we've lost! This base is rapidly running out of privates! I suppose they're all just dancing around on the moon somewhere in the far future having a grand old time! Schuster: Wait. Wait. What-What's happening? Richards? What did you do? Richards: Nothing sir. Something's coming through. Schuster: Hit the alarm! Get me Pernell! We need soldiers here immediately! Schuster: Who the hell are you? Where did you come... Wait. No. no. no. It's not possible. The most logical answer would be that the returned entity was a Cosmonaut Zombie, though why would it suddenly teleport back. Something in me craves to a more mysterious event happening there. A voice within me wants me to believe Monty was the first testperson, and Broken Arrow kinda started the whole Multiverse CoDZ Storyline, though that would be very unlogical, as Monty...sigh...is supposed to be just another magical Keeper being without any background. I just desperate hope there will be some kind of Interstellar Bootstrap Paradox plot to the whole Keeper thing, just some sciencific explanation. Though, this radio is from August 1963, and McNamara's letter from the OP is from November 1963, so IF this radio has something to do with the MPD, Broken Arrow just continued the experiment afterwards. I actually forgot myself how the Der Eisendrache easter egg went or how the steps fit together, so I watched a speedrun to try and see the details of each step. After acquiring an upgraded bow, Primis configures the teleporter to go through a unique form of time travel I don't think we've seen anywhere else. They go back in time to see Dr. Groph enter in the code for the safe, so that they can open it in the present. But when they do, they are not noticed in any way by Groph, and the doorway leading out of the room has a black aura, suggesting the pocket version of this time is only in this room. Afterwards, they return to this room, back in time, and open a crate, taking a stone slab back with them. So they can interact with the past, but cannot be seen by anyone... strange. Then they activate the death ray to knock Ultimis Dempsey out of the sky, but his pod is locked and surrounded by an electric field. They collect a Vril rod and place it into a tomb near the bow, and release the spirit of a keeper, which they give souls using the bows. With enough souls, the keeper becomes physical, arrives at Griffin Station, and teleports the MPD to the castle by entering it. It is then corrupted, and Primis fights it on the inside using the Summoning Key. After defeating it, they return and use the summoning key on the computer system to launch rockets at Griffin Station, and in turn, deactivate the field around Dempsey's pod. I'm not entirely sure why they went through the trouble of bringing the MPD to the castle, if they only cared about collecting Dempsey's soul. The MPD may have been needed in order to power the key up enough, or as long as Groph had control of it at Griffin Station, the protection around the pod could not be removed. Looking back, though, it seems odd that Samantha is not inside the MPD, given this is in the same fracture as The Giant, where Richtofen teleported her and her father away like normal. It is possible, however, that Primis Richtofen instructed Ultimis Richtofen to send them somewhere else, in order for this plan to work. He, after all, knows how the cycle goes from beginning to end. The most logical answer would be that the returned entity was a Cosmonaut Zombie, though why would it suddenly teleport back. Something in me craves to a more mysterious event happening there. A voice within me wants me to believe Monty was the first testperson, and Broken Arrow kinda started the whole Multiverse CoDZ Storyline, though that would be very unlogical, as Monty...sigh...is supposed to be just another magical Keeper being without any background. I just desperate hope there will be some kind of Interstellar Bootstrap Paradox plot to the whole Keeper thing, just some sciencific explanation. I'm hoping Monty is given some traits that make me care about him or his motivations... But I think there is something more to his human form. In the Classified cipher, we discover that inscribed on Maxis' teleporter prototype it reads: "For M , who started me on this journey." I initially thought this meant Dr. Monty as we know him, a cheeky God living in Agartha, somehow set the events of the entire story in motion despite the fact he complains constantly about how fucked up the multiverse is. But replies to a thread I made on it convinced me that Monty may have had a human form, sometime before Maxis formed Group 935, and his work inspired Maxis to form the organization and begin teleportation experiments. Human Monty must have, at some point, merged with a Keeper to become as we know him now. He makes quotes in Revelations about splitting a worm in half and both sides being similar, which many assumed meant perhaps he and the Shadowman were the same person. But it may refer to the Keeper/Apothicon that turned him so power hungry and gave him his power, and the human form that still showed interest in trying to make people happy and be a generous God, but could not handle humanity and thus decided to shape Agartha to be like the home he once knew... a small house on the English countryside. Travelling to the past contradicts with the principle of matter transference, which can only teleport and time-travel to the future. Though the fact that Groph can't see Primis and the pressence of the black aura indeed proves its no normal timetravel to the past. In fact, I don't think it is time travel at all. I think you got a very good point about that pocket dimension thing, and the MTD might be capable of creating one (Hell, we might always be doing that when we use a teleporter). The Vajra, or Vril Rod, is associated with the endless emptiness everything comes from and everything will end, the Prima Materia, in our zombies story known as Æther (in materialized form, however, we call it Divinium). In Moon Richthofen uses it to swap souls with Samantha, now ending up in her physical body, WITHIN the MPD. With﻿ enough souls, the keeper becomes ﻿physical, arrives at Griffin Station, and teleports the﻿ MPD to﻿ ﻿the castle by entering it﻿. How do you know this? Can the MPD room on Moon be seen though cameras in Der Eisendrache or something? Anyway, it is striking that once again, the process of the Vril Rod concerns soul/spirit things. Was the Keeper buried in the tomb? I'm also not sure if it are souls the Keeper fetches itself with. I believe zombies have lost their soul, and merely contain 'Life Force' (@NaBrZHuntercorrect me if Im wrong). Absorbing life force actually makes some sense: The spirit of the Keeper we initially see is merely the soul, lifeless. It needs life force to become both living and physical...and actually capable to do something. So the Keeper we see is not some vague spirit from the past, its a real, living, organic being, rezurrected from the death. And now it starts using its interdimensional capabilities. "We have discovered that there are beings that can travel between dimensions without the aid of the teleporters." To allow quick travel between dimensions the Keepers created the transference device which is powered by the Aether. The Keepers have placed structures throughout the realms." The Stone Pyramid could be part of a transport system of the Keepers, unimaginable for humans. Comparable with a radio, there is one (the MPD) transmitter and multiple (the Stone Pyramids, spread over many realms) receivers. This MPD, however, is connected with the Dark Aether and corrupts the Keeper. Haha, absolutely agreed! I guess Richthofen's Scheme goes further than only that during this Egg. The most important thing came first, collecting Dempsey's soul second. Looking﻿ back, though, it seems odd that Samantha is not inside the MPD, given this is in the same fracture as The Giant, where Richtofen teleported h﻿er and her father away like normal. Well in order to enter the MPD you need a soul, which this fracture's Samantha doesn't have since her only soul is in the House now. Leaving soulless, I think Samantha never got that far after being teleported to Griffin Station. @anonymous Actually, zombies do still have their souls, per Sherwood’s “The One” as well as Stuhlinger’s ability to hear their voices (Die Rise). Hmm, gotta admit, forget about that. But the BO3 story taught us that having a 'soul' is kinda unique. Why do only have the Ultimis of the fractures have souls, and are, for example, Primis soulless. I also believe in the Quantum Souls Theory, though one argument against this could be the fact that Richthofen has both a soul in the Original Timeline/MPD/Zombie Richthofen, AND the innocent soul captured from the child Eddy in Dimension Whatever. Not saying that none zombie has a soul, but couldn't it possible that some zombies have a soul, and some having a soul in another universe? "Edward, as you know it is imperative you and the group find the exact versions of yourselves that I have highlighted in each universe. Only by killing that version of yourself in that particular universe at that particular moment in time will we be successful once each of you other selves are killed across all the universes. Remember, we are only immune because we opened the portal in France but I am afraid this might not be permanent. I fear there is something M isn't telling me and that there is not much time left for us." This doesn’t seem to suggest that only those particular versions at that particular time have a soul, but that they are the original souls that have deviated from all the teleportation. So essentially every mortal soul was in the original timeline, but through tears created, deviations were created and copies were made that split off in other dimensions. But only version is correct, and by collecting that soul before my tearing can occur, you can wipe out all versions of that person from every dimension, and protect the immortal soul. This would explain Samantha not appearing in the Der Eisendrache fracture, as she was wiped from existence and her soul is in the house. The timeline states the same thing happened to Maxis. And as this cipher states, Primis still lives on because they went through the portal, and later because of the blood. Point being, I don’t think we can definitively say there is only one soul per person. Immortal soul? Definitely. After the fracture, that’s entirely possible. Souls are singular in their existence as far as we know, so outside of knowing that the Ultimis universe zombies had souls, I don’t know if we can determine in what other cases they do, though based on the way the 4 OG souls were scattered after the rift, it’s possible that any number of zombies in any given universe have souls, while others do not. Best place to look for more info on that would be Sherwood’s later works. Edit: I haven’t looked into Quantum Souls yet, but if I can deduce its meaning, I can see how it might be possible.